I’m excited to share this fun project with you today. I’ve had so much fun playing with candy and trying not to eat it over the last few days while I was creating these projects. 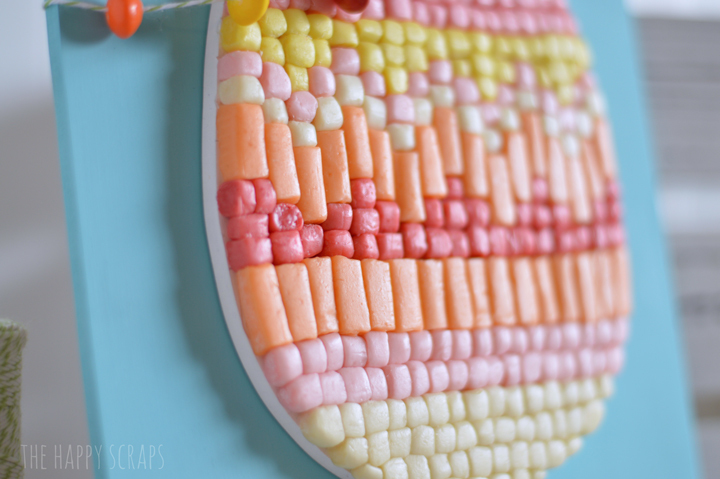 Today I’m going to show you how I made this fun Skittle Garland and Starburst Easter Egg Decor. I broke open the box of candy. I don’t know who was more excited about it, my boys or me. We were all excited to get to eat the leftover candy, once the crafting was done. 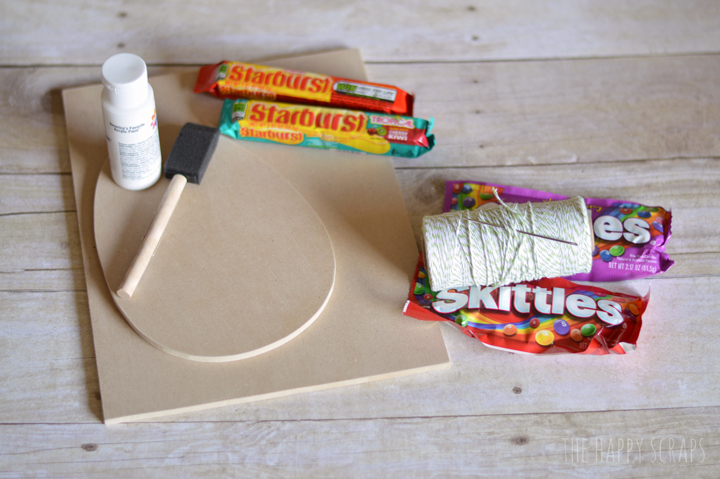 To get started, I grabbed a couple packs of Skittles and Starburst, along with the twine and needle, wood (I had my husband cut it for me), paint, and paint brush. I also grabbed my glue gun. I painted the egg white, and I made sure that the edges were painted good. After the paint dried, marked some pencil lines on the egg, to help keep the design straight. Next I opened up the Starbursts and cut most of them into nine pieces. I chose to leave the orange ones as longer pieces. I thought it would be easiest to start with the bigger pieces to line it all up. Once I got the orange laid out, I got the glue gun out and started gluing each piece to the egg. I just worked up from the orange starbursts. Once I got to the top, I went back and finished the bottom. One thing that was nice about working with the starbursts was that I could mold them to fit where they needed to. I also turned over the egg and pressed it on a flat surface, once I had all the starbursts glued on. It helped to keep the front of egg a little smoother. 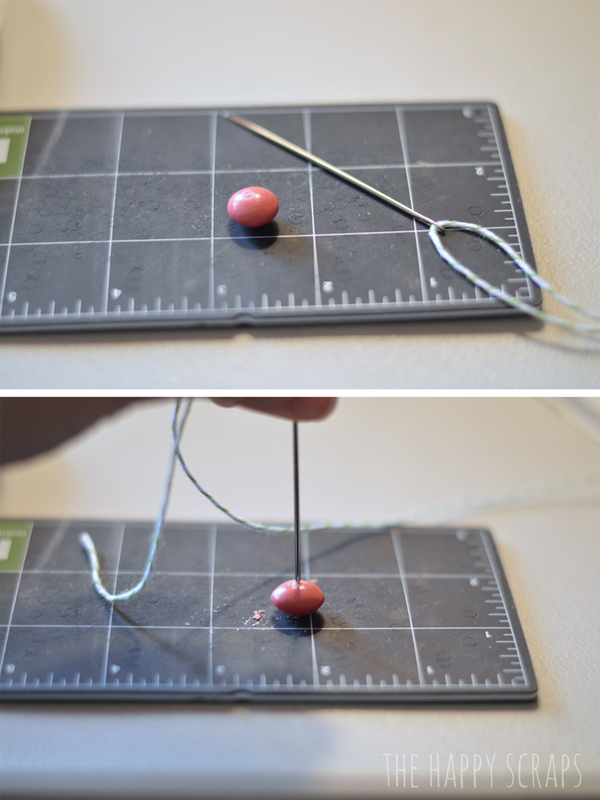 Once I had the egg all done, I got out the needle & twine, and started stringing the skittles onto it. The skittles do crack a little bit when you poke the hole, but they stay on the string just fine, and they are just so cute all strung together! I almost think the egg has a mosaic look to it. Isn’t it fun!? Once I had it mounted on my board, I decided to cut a little Easter vinyl and stick it on. 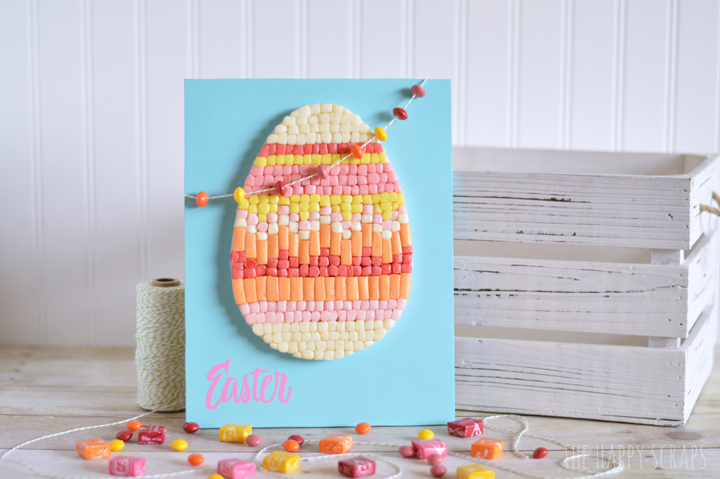 This is such a fun piece to put up for Easter. My kids think it is so cool too! 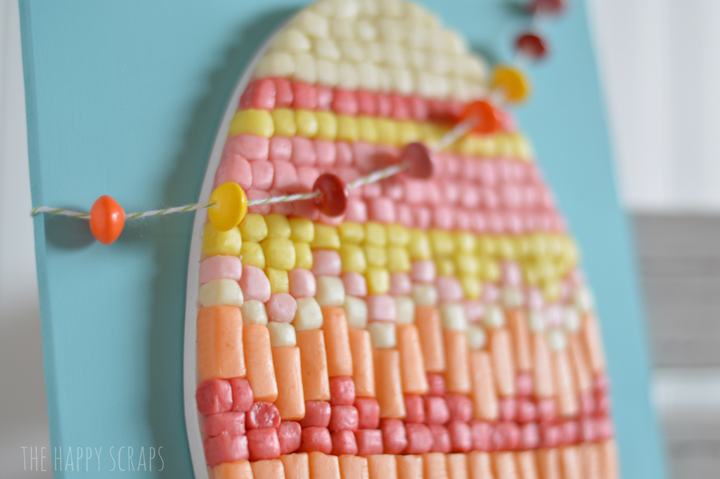 Have you ever crafted with candy before? It can be really fun! Oh my gosh! How cute is that? I would have to put it up high so my kids wouldn’t pick the candy off of it. 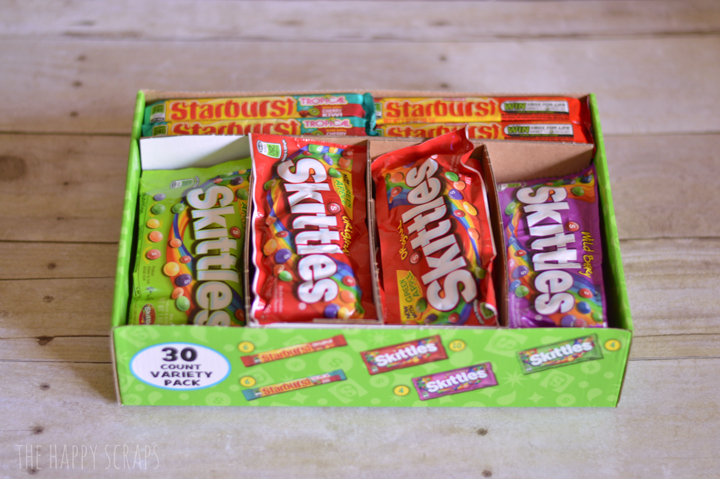 Starburst and Skittles are an Easter staple in our house. Seriously?! How cute is this! I love it and it is so colorful! So cute! I’m curious if this will last for more than this year. 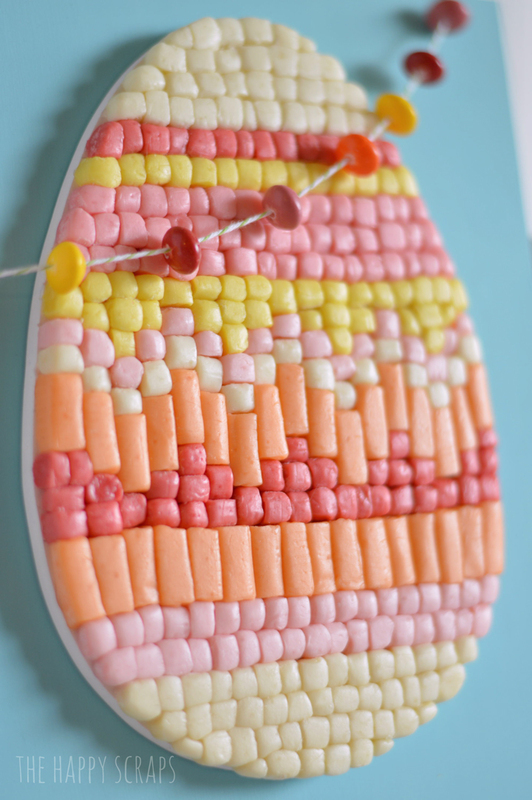 I made a craft with jelly beans once and they all faded, so it didn’t look good enough to use the next year. Let me know! 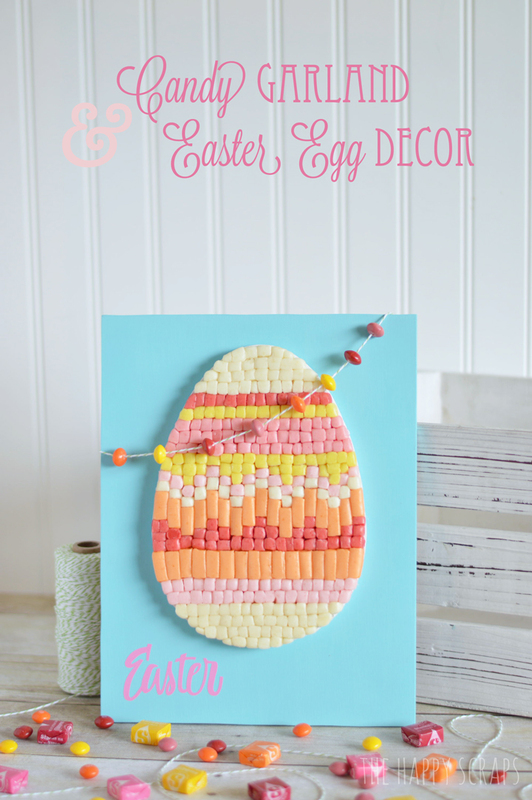 This is adorable and I really love haw much texture and bright color the candy added! I LOVE this idea! It turned out darling! Did you spray it with a clear coat or anything? I am just curious to know how it will hold up. Keep me posted! I love the idea of mosaicking with candy. Its not just for gingerbread houses anymore! Oh my goodness!! 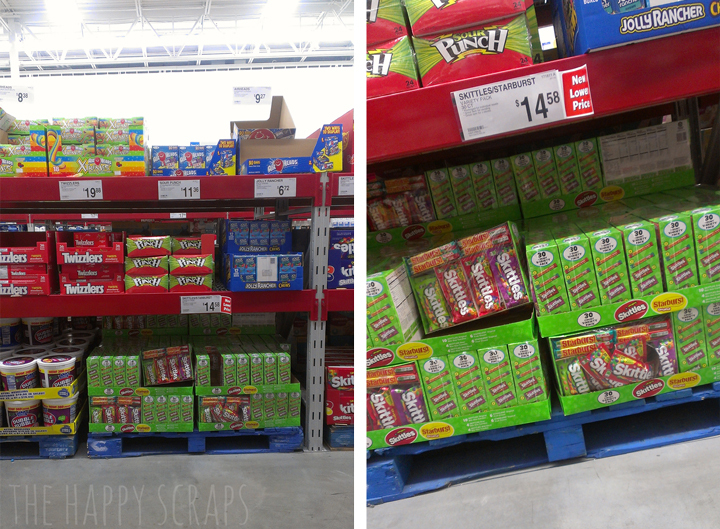 I couldn’t imagine the patience you had to have cutting all those Starbursts into just the right size! It looks awesome though! Thanks for linking up to this week’s Catch a Glimpse party. I’ll be featuring this tomorrow. This is seriously the CUTEST idea. I love love love that mosaic candy! This is such a sweet and fun project to do with the kids! I just wanted to let you know that I am linking to this post on 4/8 at Simply Creative Living.com if you don’t mind.